Revolt of the Wonder Weapons! Give Her Liberty - Give Her Death! 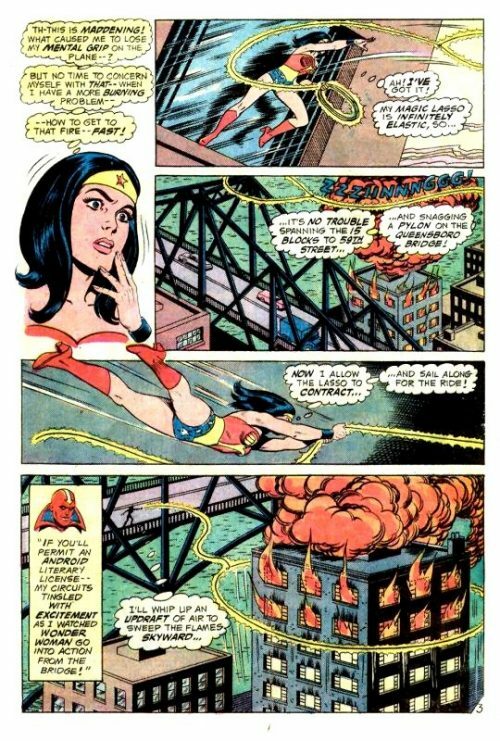 Beginning with the previous Wednesday, Diana Prince is about to break for lunch when she sees from her office window that a nearby apartment block is ablaze. Locking her door, she uses her magic lasso to transform into Wonder Woman and steps out onto the ledge to summon her invisible plane. But as the jet approaches, it suddenly loses control and and to Wonder Woman’s dismay crashes into the East River! She wonders what could have made her lose her mental grip on the plane but realises that time is running out. She instead uses her lasso to stretch across several blocks and rope a pylon near to the burning building. Letting her lasso then contract, she pulls herself across the distance to the scene of the fire. She then uses the golden rope to whip up an updraft of air to sweep the flames skyward until they form a ball of fire, which she then tosses into the river. The Red Tornado’s tale then recounts the events leading up to this scene. A man by the name of Damon Celestris, working as a personal astrologer to prominent public figures, uses his abilities to gain power from those he helps in both industry and government. Damon’s astrological gifts are, in fact, a hoax and he actually uses a machine called the Mento-Amplifier to extract positive thinking from an unsuspecting source and to then amplify it. With this done, he then channels that power into his clients through post hypnotic suggestion, allowing them to fulfill their dreams as ‘foretold’ by him. Damon does not know who the source for his machine is and he does not really care, although he does wonder what the person would say if they knew he was tapping their unique concentration to power his device. However, one draw back is that the device keeps overloading and exploding, taking him weeks to rebuild it again. He begins to form an hypothesis and when the device destroys itself the next time he looks out of the window to see Wonder Woman flying past in her invisible jet. He guesses that whenever she works one of her ‘Wonder Stunts’ she interferes with the thought waves from his unknown ‘source’, causing it to break down. He decides that if he can give people will power, then why can he not give the ‘Wonder Chick’ a dose of will not power? He therefore plans to convince her that she is incapable of controlling her wonder weapons and that she has become a menace to New York, forcing her to leave. So, after Damon’s first ‘attack’, causing Wonder Woman to lose control of her own jet, the Amazon Princess contacts her mother, Queen Hippolyta, asking for her assistance in recalling her plane from the river bed. She then flies to Paradise Island in her plane which is now controlled by the queen. Just as she lands however, one of the Amazons loses her footing and falls from a nearby hill. Wonder Woman instantly produces her lasso, ready to catch the falling woman but only succeeds in wrapping herself within the golden rope! Finding herself completely wrapped in its coils, she literally thinks on her feet and commands herself to save her Amazon sister. Compelled by her own lasso, she has to react, and removes her feet from her boots. She then quickly lies on the floor and rolls across the ground, positioning herself beneath the falling Amazon. Lifting her now bare feet up at the last minute, she manages to catch her, although not in the most comfortable way she would have wished! 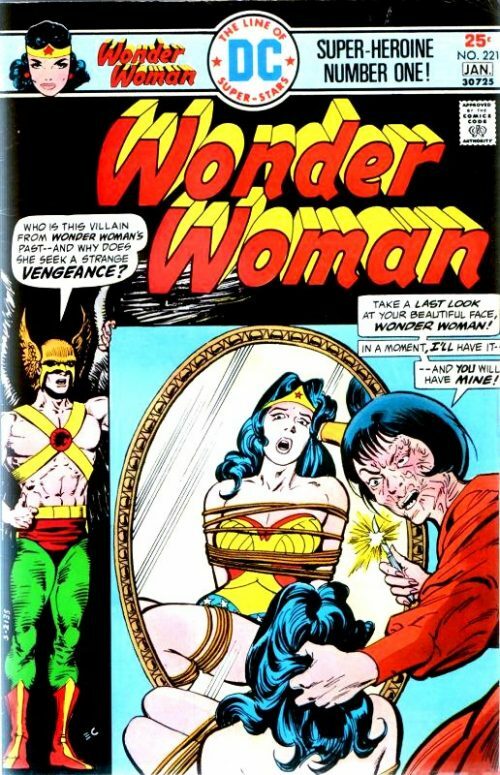 Afterwards, her mother congratulates her on using her Amazon ingenuity, but Wonder Woman is concerned that she keeps blundering and wonders if it will happen again? The queen suggests she use the Magic Sphere to find an explanation and, although the device is not functioning fully, she does manages to see the faint image of Damon together with astrological star charts. However, while she knows she has seen this man before, she cannot remember who he is and returns to New York more puzzled than ever. 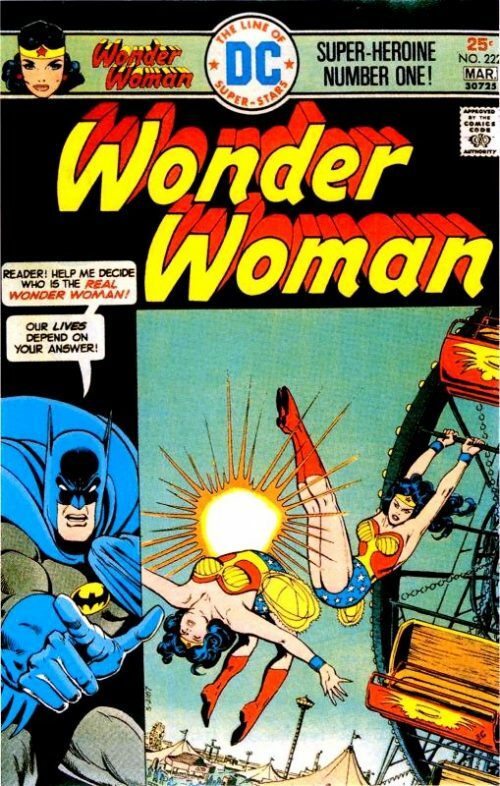 As the days go by, Wonder Woman falls victim to more blunders. When confronting an armed bank robber, she throws her Tiara to disarm him, but it returns like a boomerang clouting her forehead. As he opens fire on her, she manages to deflect his bullets but is unable to control the ricochets which fly towards innocent bystanders. However, although her ‘weapons’ are affected, her strength is not and she finally manages to overpower the robber. 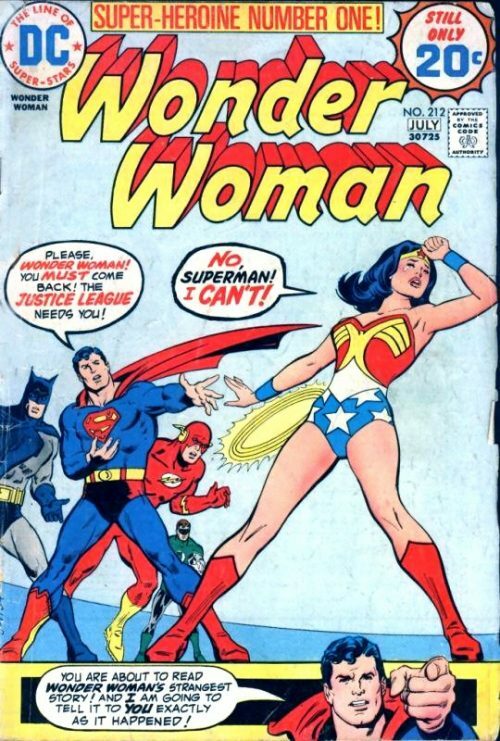 As the situation becomes more desperate for Wonder Woman, she has a stroke of luck. While reading the paper in her Diana Prince guise, she sees an article about Damon Celestris with an accompanying photo and she recognises him from the Magic Sphere. The paper says that he will be giving a mass ‘reading’ in central park that evening. And so, a few hours on Wonder Woman listens from a distance to Damon who is standing on a raised platform, addressing an attentive crowd. Suddenly, one of the struts gives way and Damon loses his footing, only managing to hang by his fingers from the high platform. Wonder Woman knows that she would normally be able to handle this with her wonder weapons, but realises that she will have to rely on her own abilities instead. Just as he loses his grip and falls towards the ground, she leaps up and catches him in mid air. As she lands back on the ground, he curses, letting slip that if she had not interfered in the first place he would never have had to ‘screw up’ her powers. He instantly realises his slip up and finds himself confronting an angry Amazon. As she begins to twirl her rope around over her head preparing to lasso him however, he smiles confidently, telling her that she will be unable to control the golden rope. Driven by sheer determination to prove him wrong, she overcomes his hypnotic suggestion to fail and ensnares the surprised astrologist. Powerless to resist her commands to tell the truth, he reveals his scheme and leads her to the Mento-Amplifier which has again exploded. She surmises that she was, in fact, the unknown source of the machine’s power and that whenever she used deep concentration the device overloaded. She tells Damon that his anti Wonder Woman campaign was doomed from the start because had he succeeded in stopping her using her powers, he would have lost the very ‘fuel’ for his own machine. The Red Tornado then rounds of his report by concluding that Damon had underestimated the power of a woman – especially a ‘Wonder Woman’. 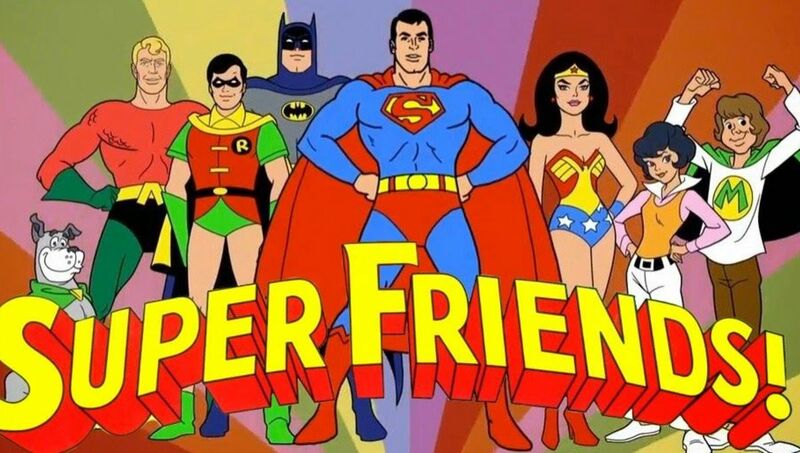 It reveals an old enemy of the Justice League, the sorcerer Felix Faust. Using his magic, he summons demons before him and asks for their guidance. He tells them he wants to make the people of America his slaves but has exhausted all his knowledge trying to achieve it. They reply that he should attack their most prized symbol of freedom – the Statue of Liberty. He should shrink it in size and then wear it around his neck to show his supreme power over his ‘slaves’. They then disappear in a puff of smoking, leaving him some books full of mystic texts. Meanwhile, Diana Prince is on board a ferry in New York harbour taking the opportunity to do some sight seeing. Suddenly, the nearby Statue of Liberty springs to life and hurls its book at visitors down below, sending them running for their lives. 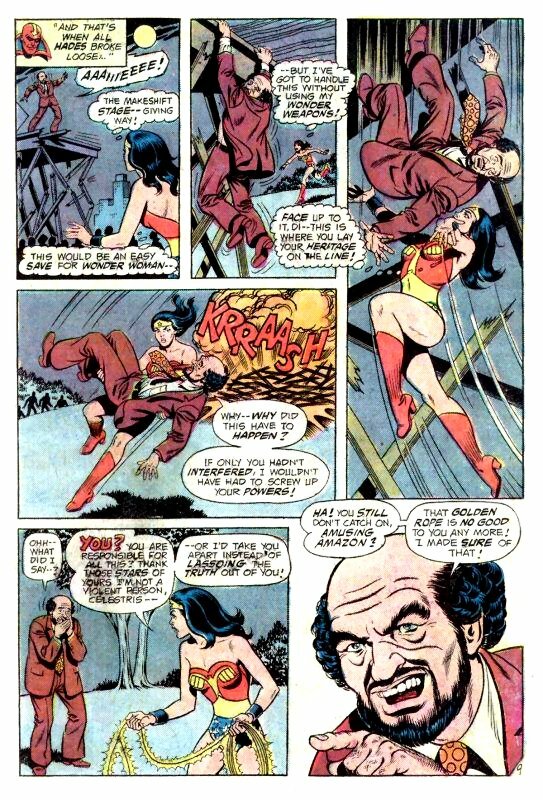 In the confusion, Diana manages to throw herself overboard and transforms into Wonder Woman under the water. That done, she summons her robot plane which swoops down to pick her up. Once on board, she then flies towards the giant statue. She gives thanks that it is now closing time and that there are no visitors actually inside the statue itself. Using her lasso, she binds it and commands it to stop moving. However, in response it tries to smash her with the torch it carries and she barely manages to avoid it in time. She realises that whatever magic has animated the statue must be too strong for her lasso and she decides to remove it. As soon as she does so the statue then begins to shrink in size! She then notices a strange screeching sound that almost sounds like speech and the almost human sized Statue of Liberty takes off into the air in the direction of the sound. 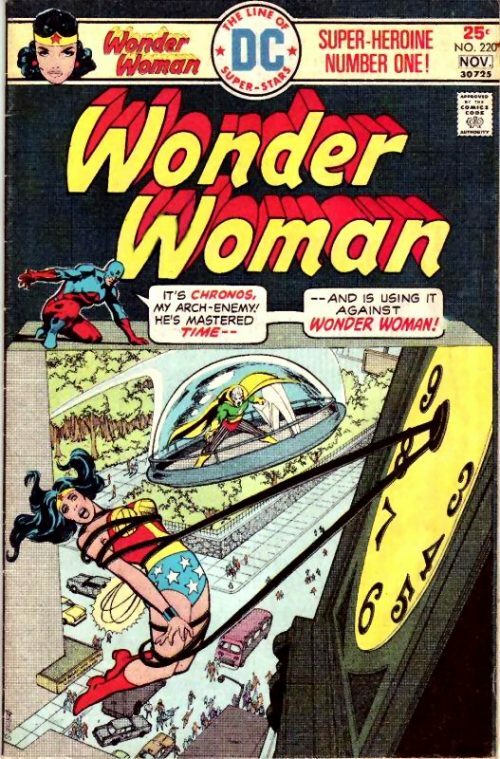 Wonder Woman gives chase in her invisible jet and follows it to the old World’s Fair Grounds on Long Island. The Statue, which is continuing to shrink, touches down and turns to fire a beam at the approaching Amazon. 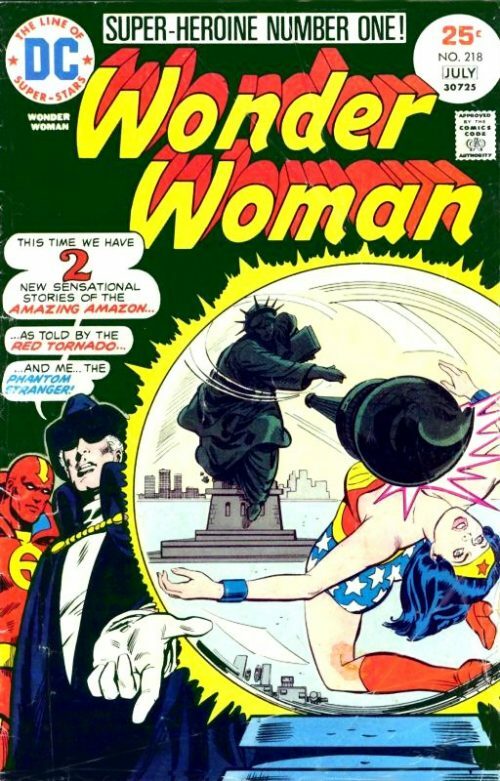 Instantly, Wonder Woman finds her hands manacled with chains and because Faust – a man – is responsible she loses her powers. The Statue then fires one of the spikes from its crown at the helpless Amazon Princess, knocking her out cold. When she comes to she finds herself strapped down inside a glass cage. Faust informs her that she is imprisoned within his very own Death House and he intends to gas her to death! He gives her one last request and tells her that she has just enough time to ask one question only. She sees he is now wearing the shrunken Statue of Liberty around his neck as an amulet and asks him why. Laughing, he replies that he would answer one question – but that was not the one! She in turn replies that she will have the last laugh and emits a high pitched screech. Instantly, the manacles holding her dissolve to the amazement of Faust. As she smashes out of the glass cage, he takes flight, baffled as to how she had managed to do that. As she pursues him, she informs him that although he had been clever in sending out the incantation which controlled the Statue as an inaudible high-frequency signal, he had not counted on the vibrations of her magic lasso altering those frequencies and thus allowing her to hear it. With her Amazon knowledge of all languages, it was not hard for her to translate the spell and reverse the magic that had imprisoned her. 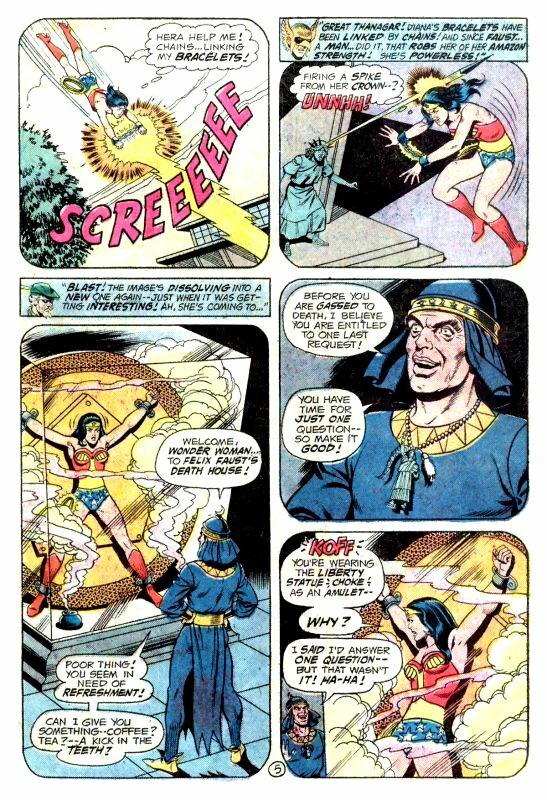 Faust manages to make it to another room and uses his magic to bring a portcullis crashing down in front of Wonder Woman. But she smashes through it and confronts the sorcerer. Then she emits another screech and reverses the shrinking spell over the Statue. It begins to grow in size weighing heavily around his neck and he emits his own incantation to cancel it. 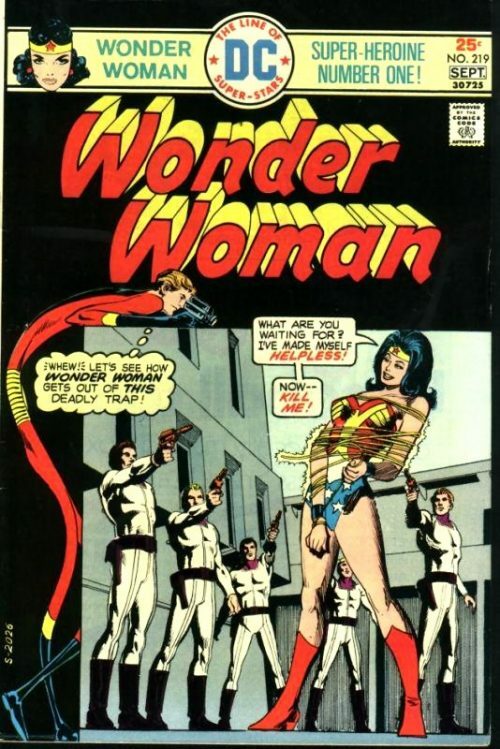 But Wonder Woman uses her lasso’s vibrations to nullify his ‘signal’. In panic, he tells her he must have the Statue for himself and reveals that the mystic books left for him by the demons indicated that the magical forces of the universe were in alignment the very night the statue of Liberty was completed. It therefore not only embodies the spirit of liberty symbolically but also in reality to! In desperation, he fires mystic energy bolts at Wonder Woman but she uses her bracelets to reflect them back at Faust, knocking him out. She then returns the Statue to its rightful resting place and converts it back to its correct size. His tale over, the Phantom Stranger disappears leaving the Justice Leaguers to ponder over Wonder Woman’s latest success…power of a woman – especially a ‘Wonder Woman’.